A 44-year-old Vietnamese woman presented to the emergency department with a 10-day history of progressive blurry vision in both eyes and a three-day history of severe headaches. Her central vision loss had not improved with a refraction by her optometrist. Her severe occipital headaches worsened with movement and were associated with generalized malaise, extreme fatigue, mild photophobia, and tearing. Acetaminophen partially alleviated the pain. She had recently traveled to Vietnam but denied encountering sick contacts there. She denied jaw claudication, fevers, or weight changes. She denied skin rashes, hearing changes, tinnitus, dizziness, numbness, or tingling. She denied ever having tuberculosis. She had no history of prior vision problems, autoimmune conditions, or cancer. She immigrated from Vietnam several years prior to presentation. She is married and has three children. She works at a nail salon. She does not consume tobacco products, alcohol, or illicit substances. She travels to Vietnam every six to twelve months. OD: 3+ cystoid macular edema (CME) and subretinal fluid (SRF) extending from the disc to the temporal macula. No lipid or exudates. Boggy-appearing choroid. OS: 2+ CME and SRF extending from the disc through the fovea. 1-2+ linear lipid extending from disc towards fovea. Boggy-appearing choroid. Figure 1: Color fundus photographs at presentation: (Left image) The right eye has disc edema and mild hyperemia as well as subretinal fluid extending from the disc temporally through the macula. There is also a focal serous retinal detachment superotemporal to the disc, along the superior arcade. (Right image) The left eye has disc edema and mild hyperemia, along with subretinal fluid extending from the disc to the macula and linear lipid deposits in the nasal macula. Figure 2: Optical coherence tomography (OCT) of the right eye (upper panels) shows a serous retinal detachment involving the fovea with extensive overlying intraretinal fluid, disruption of the outer retinal layers, and undulations of the thickened choroid. OCT of the left eye (bottom panels) shows a serous retinal detachment in the nasal macula extending up to the fovea. 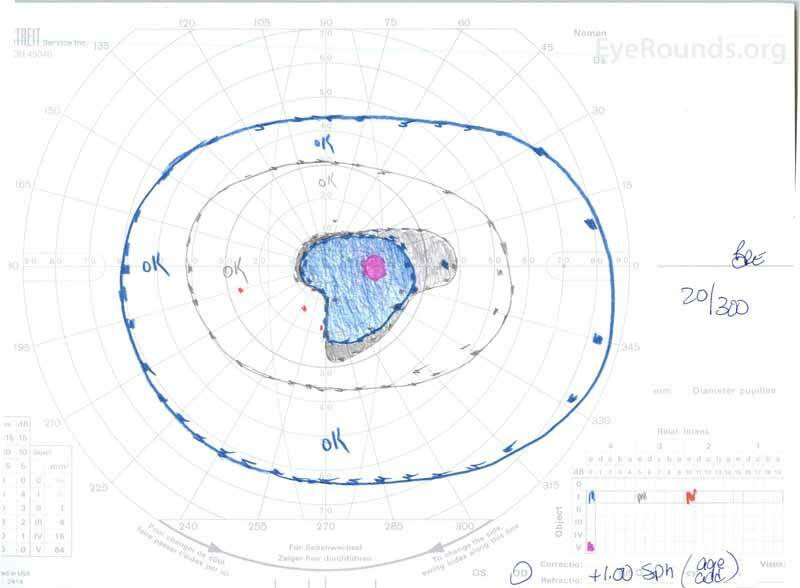 Figure 3: Goldman visual fields (GVF), OU. (Left image) OS shows an enlarged physiologic blind spot and mild central scotoma. (Right image) OD shows a moderately dense central scotoma incorporating the physiologic blind spot and extending inferotemporally. The patient was initially evaluated by the emergency department given her complaints of new-onset severe headaches and vision loss. Brain computed tomography (CT) and magnetic resonance imaging (MRI) scans were unremarkable. ESR and CRP were within normal levels. The ophthalmology clinic evaluated her the following day and found bilateral serous retinal detachments and panuveitis. ACE and QuantiFERON-TB Gold labs were both negative. She was diagnosed with Vogt-Koyanagi-Harada disease based on her clinical presentation and Asian descent. She was treated with 80mg of prednisone daily, acetaminophen as needed for headaches, and Vitamin D and calcium supplementation. Her headaches rapidly resolved, and her visual acuity steadily improved over the following two weeks. Her prednisone dosage was then tapered down to 40 mg over three weeks with continued resolution of symptoms and improvement in visual acuity. She had no recurrence of headaches or worsening vision during the prednisone taper. At her most recent appointment, she had tapered down to 5mg every other day, without return of symptoms. Her visual acuity at that follow-up visit was 20/15-2 OD and 20/20+2 OS, and macular OCT showed full resolution of disc edema and serous retinal detachments in both eyes (Figure 4). Figure 4: Optical coherence tomography showing subretinal fluid at baseline (top) and the course of resolution at one week (middle) and five weeks (bottom) while on a high-dose oral prednisone taper. 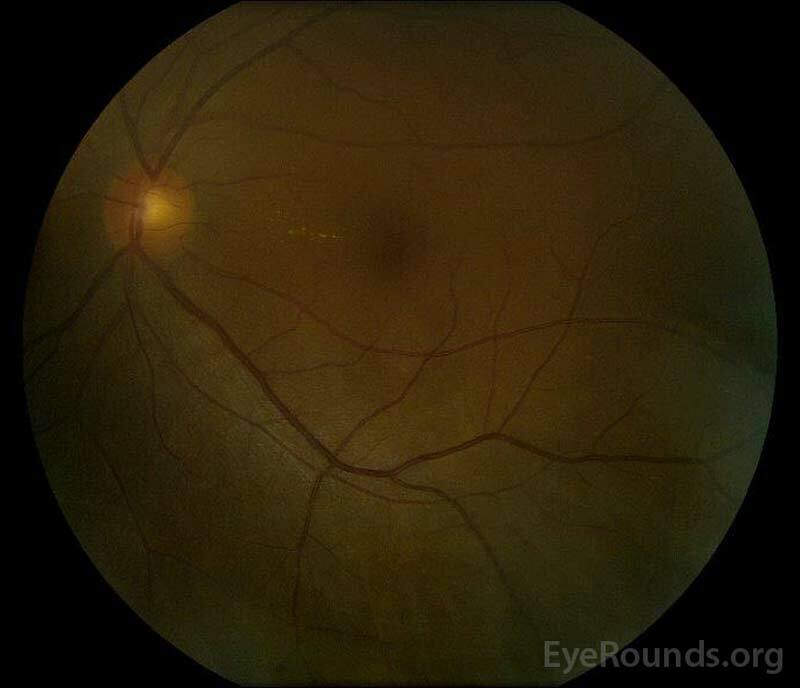 Note the smoothing out of the choroidal undulations with treatment. Figure 5: Color fundus photography of the right (A) and left (B) eyes during the convalescence phase demonstrating improvement in the subretinal fluid and disc edema. Vogt-Koyanagi-Harada (VKH) Disease is a systemic autoimmune condition characterized by bilateral non-necrotizing granulomatous panuveitis associated with extraocular integumentary changes, such as poliosis and vitiligo, and inflammation affecting the uvea, inner ear, hair, and meninges. Harada disease is the isolated uveitis without the systemic signs or symptoms of VKH. The etiology of VKH disease is still largely unknown despite current research efforts. It is thought to be an acquired autoimmune disease involving T-cell-mediated hypersensitivity to melanocytic self-antigens, with an underlying genetic predisposition and possible microbial trigger . Tyrosinase and tyrosinase-related peptides are melanocyte antigens that have been suggested as targets of autoimmune processes in VKH . However, increased risk of VKH disease was not associated with the tyrosinase gene family, according to one study . Because of the increased prevalence among certain ethnic and gender groups, there is thought to be a genetic predisposition in the pathogenesis of VKH. Multiple genes, including human leukocyte antigen (HLA) and interleukin (IL) genes, have been associated with VKH in different ethnic populations . HLA receptors are major histocompatibility complexes in humans that present peptides to the immune system. HLA-DR1, HLA-DR4, HLA-DRB1*0405, and HLA-DRw53 are several haplotypes found in patients with VKH disease [5,6]. HLA-DR4 is more common in Japanese and Hispanic people, while HLA-DRB1*0405 is more frequent in Korean and Middle Eastern patients . Both the HLA-DR4 and HLA-DRB1*0405 alleles are found in Vietnamese patients . The HLA-DRB1 receptor binds to melanocyte antigens in varying capacities. Despite these associations, genetic testing is not recommended at this time. Given the usual prodromal symptoms that accompany VKH, including fever, headaches, meningismus and tinnitus, an inciting viral etiology has been suggested as a trigger for VKH onset through mechanisms of molecular mimicry in genetically predisposed patients. Cytomegalovirus envelope glycoprotein H has significant amino acid homology to the tyrosinase peptide, and CMV infection may trigger VKH through molecular mimicry (i.e., recognition by HLA-class II receptors) . Ebstein-bar virus (EBV) has also been implicated. However, there has been no definitive evidence regarding a viral etiology of VKH, and it remains unclear what triggers the VKH autoimmune response . There are four classic phases of VKH that can have variable presentations: prodromal, acute uveitic, convalescent, and chronic-recurrent. Histopathologic changes typically begin in the acute phase . The acute uveitic phase is characterized by bilateral uveal thickening secondary to granulomatous inflammation. The granulomas consist of lymphocytes, macrophages, and granule-filled epithelioid and giant cells [10,11]. Although the epithelioid cells were previously believed to be altered melanocytes, a follow-up immunohistochemical study suggested an origin from tissue macrophages instead [1,12]. Granulomas filled with epithelioid histiocytes, termed Dalen-Fuchs nodules, can often be seen between the retinal pigment epithelium (RPE) and Bruch's membrane. The uveal granulomatous inflammation leads to choroidal thickening and exudative retinal detachments filled with proteinaceous fluid. In addition, pleocytosis (i.e., increased cell count) may be present in the anterior chamber and vitreous [7,11]. The convalescent phase is identified by depigmentation of the choroid and extraocular areas, including the periocular skin and hair. 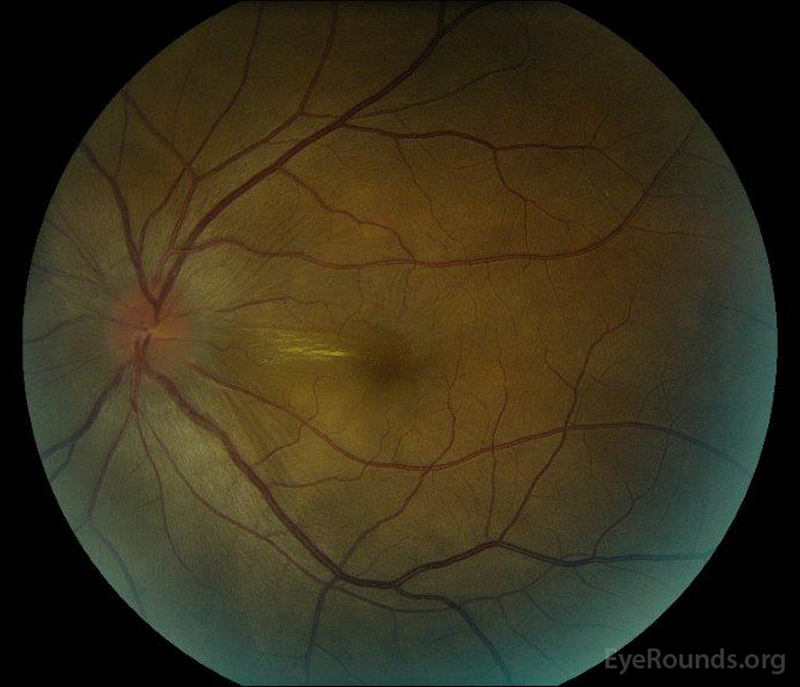 A depigmented choroid set against a pale optic nerve gives the impression of a "sunset-glow" fundus, which is a classic feature of this phase of VKH . In addition, Dalen-Fuchs nodules become more prominent underneath the RPE in the convalescent phase . The chronic-recurrent phase is characterized by decreased choroidal thickness, resolution of serous retinal detachments, chronic mild vitritis, and recurrent granulomatous anterior segment inflammation. Choroidal neovascularization (CNV) and subretinal fibrosis may develop during this phase and are indicators of severe disease progression [7,11]. Cataracts and secondary glaucoma are other complications of long-standing or recurrent inflammation in this phase . VKH is prevalent in races with darker skin pigment, especially Asians, South Americans, Middle Easterners, and Native Americans. VKH disease accounts for >10% of uveitis in these populations [5-7,10,11,13,14]. Only 1-4% of uveitis cases are thought to be secondary to VKH disease in the United States (7). In the United States, most cases of VKH have been found to affect individuals of Asian, Hispanic, and/or Native American decent . Interestingly, VKH disease rarely affects Africans despite their dark pigmentation . The incidence of VKH disease varies greatly between racial subgroups in neighboring countries [1,7,10] . For instance, Korea's incidence of VKH is only 2%, much lower than that found in Japan and China . VKH has a typical onset of 20 to 50 years of age [17-20]; however, studies suggest that 3.1-13.4% of VKH cases are pediatric patients and 10% of cases are ≥65-years-old . Classically, VKH is thought to have a predilection for the female gender, and while most studies show that VKH disproportionately affects women, a few studies have shown a male predisposition or no gender predisposition . As aforementioned, the four stages of VKH disease are prodromal, uveitic, convalescent, and chronic recurrent. Each stage exhibits distinct clinical features. Prodromal: This initial stage may present as a influenza -like illness with predominantly constitutional symptoms, such as headache, dizziness, fever, fatigue, and/or nausea. Neurological symptoms of meningitis, cranial nerve palsies, and optic neuritis, as well as auditory symptoms of tinnitus, dysacusis, and vertigo have been reported [5-7, 10]. Photophobia, blurred vision, floaters, and/or eye pain usually begin within 48 hours of prodromal symptoms . The prodromal phase typically lasts from a few days to weeks. Acute Uveitic: This stage includes blurry vision, photophobia, conjunctival injection, and eye pain. There may be mild anterior uveitis that at first appears non-granulomatous. Unilateral onset typically transitions to bilateral involvement within 1-2 weeks. Granulomatous anterior uveitis with mutton-fat keratic precipitates may develop. 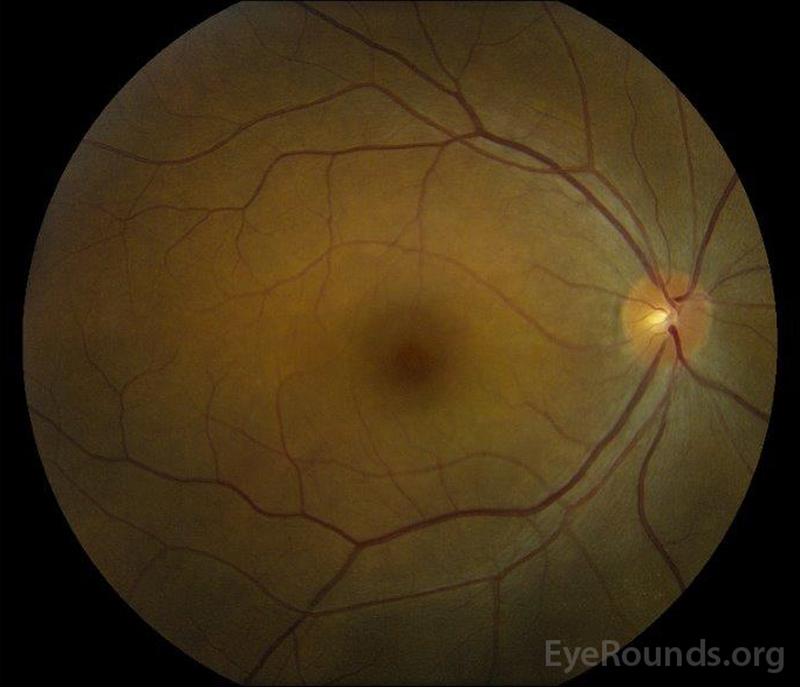 Posterior exam findings may include optic nerve edema and hyperemia , multifocal areas of choroiditis, multiple areas of serous retinal detachments localized to the posterior fundus, choroidal thickening, radiating chorioretinal folds, and vitritis [6,7,10] . Serous retinal detachments may form a cloverleaf pattern in the posterior fundus and could progress to extensive bullous detachments in severe cases . Acute inflammatory glaucoma has been associated with this phase of the disease and can present with a shallow anterior chamber secondary to ciliary body edema, mimicking acute-angle closure . The duration of the acute uveitic phase depends on the prompt diagnosis and management. Chronic Uveitic or Convalescent: This stage typically develops several weeks after the acute phase and is characterized by vitiligo (e.g., face, hands, shoulders, or back), poliosis, and alopecia . Depigmentation near the corneal limbus, known as Sugiura's sign, can be seen one month after disease onset ; however, this sign is rarely seen outside of the Japanese population . 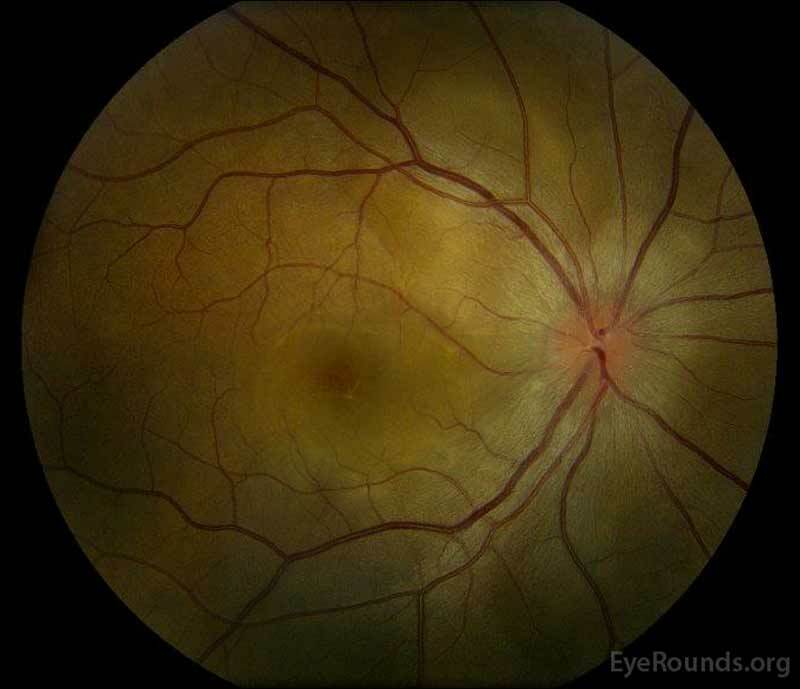 Choroidal depigmentation usually occurs over a few months and results in the bright orange-red color of the choroid and the classic "sunset glow fundus." Sunset glow fundus is thought to be the most important and predictive in the diagnosis of chronic VKH . Well-defined, round, nummular chorioretinal scars can form in the mid-periphery. The chronic uveitic phase typically lasts several months. Chronic-recurrent: This stage is characterized by recurrent episodes of granulomatous anterior uveitis with mutton fat keratic precipitates, iris nodules, iris depigmentation, posterior synechiae, posterior subcapsular cataracts, secondary glaucoma, choroidal neovascular membranes, and, ultimately, subretinal fibrosis and nummular chorioretinal atrophy [23,24]. The chronic phase typically develops at least six months after initial presentation. The serous retinal detachments present during the acute and convalescent phases typically do not recur with aggressive corticosteroid treatment . The most recent diagnostic criteria, named the Revised Diagnostic Criteria (RDC) for VKH, were defined in 1999 at the First International Workshop on VKH . These are outlined in Table 1. The RDC are useful in that they divide VKH into three different diagnostic categories based upon the disease phase during which a patient presents: complete, incomplete, and probable. This categorization of disease allows for appropriate and early management in "probable" disease that may help prevent progression to "complete" disease. Work-up for other causes of ocular inflammation, both infectious and auto-inflammatory, are essential. These can include erythrocyte sedimentation rate (ESR), C-reactive protein (CRP), quantiferon-Gold testing for tuberculosis, rapid plasma reagin (RPR) for syphilis, angiotensin-converting enzyme (ACE) and a chest x-ray for sarcoidosis, antinuclear antibody (ANA), and p-/c-ANCA. Also, a history of recent ocular trauma or intraocular surgery must be noted and likely suggests sympathetic ophthalmia (SO) as the more likely diagnosis given the very similar presentation and pathophysiology shared between SO and VKH . To support a diagnosis of VKH in equivocal cases, a lumbar puncture can be performed to look for lymphocytic and monocytic pleocytosis; however, this is rarely employed clinically. Eighty percent of patients have pleocytosis in the cerebrospinal fluid (CSF) within one week and 97% have pleocytosis within three weeks. Increased levels of immune cells can last up to eight weeks after disease onset [1,11] . The T-cell surface marker profiles are similar between the CSF and the aqueous humor but different from the blood. 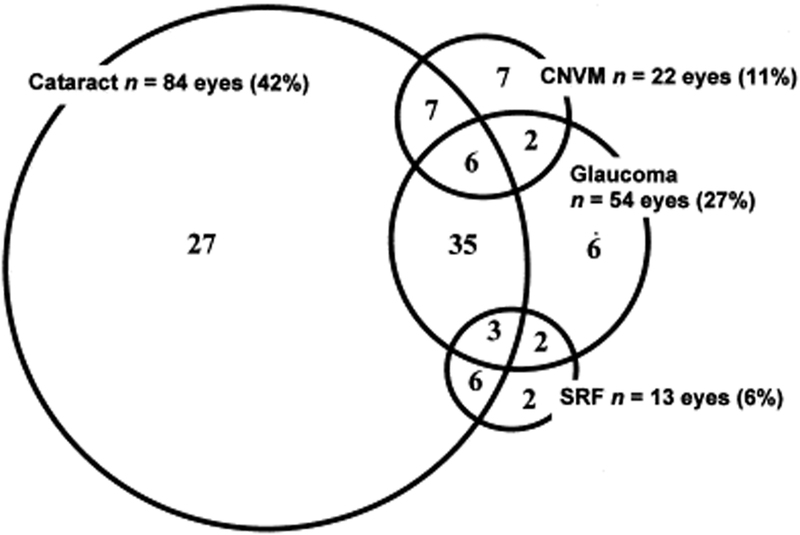 This suggests the ability of CSF to accurately reflect uveal inflammation in VKH disease . *From Table 1 in (15). No history of penetrating ocular trauma or surgery preceding the initial onset of uveitis. No clinical or laboratory evidence suggestive of other ocular disease entities. Bilateral ocular involvement (a or b must be met, depending on the stage of disease when the patient is examined). Diffuse choroidal thickening, without evidence of posterior scleritis by ultrasonography. Ocular depigmentation (either of the following manifestations is sufficient): (a) Sunset glow fundus, or (b) Sugiura sign. Recurrent or chronic anterior uveitis. Neurological/auditory findings (may have resolved by time of examination). Integumentary finding (not preceding onset of central nervous system or ocular disease). Integumentary findings; as defined for complete Vogt-Koyanagi-Harada disease above. Bilateral ocular involvement as defined for complete Vogt-Koyanagi-Harada disease above. " Optical coherence tomography (OCT): In the acute uveitic phase, OCT will likely show significant choroidal thickening and serous retinal detachments. The subretinal fluid accumulations may have septations believed to be fibrin membranes and inflammatory products, creating a lobular structure that can also be seen on fluorescein angiography. In the convalescent phase, OCT can detect areas of retinal thinning following resolved inflammation after corticosteroid treatment [1, 6, 7, 11]. B-scan ultrasonography: In the acute phase, ultrasonography may show diffuse posterior choroidal thickening, posterior scleral thickening, retinal detachments, and vitreous opacities [1, 7, 11]. Ciliary effusions may be observed with ultrasound biomicroscopy . This test is also useful for ruling out posterior scleritis. Fluorescein angiography (FA): Classically, FA reveals multifocal choroidal hypofluorescent dots at the early phase followed by multiple focal hyperfluorescent areas with diffuse leakage in the late phase [6, 7]. The dye leaks through the RPE and accumulates in the subretinal space surrounding the hyperfluorescent dots. FA can be diagnostically useful when VKH disease presents without extraocular symptoms. Optic disc hyperfluorescence and window defects caused by atrophic chorioretinal scars may be seen in the mid-periphery [1, 5, 11]. FA in the chronic-recurrent stage of VKH disease shows nonspecific window defects due to RPE damage, choroidal neovascularization, and subretinal fibrosis [1, 11]. Indocyanine green (ICG) angiography: Early phase ICG depicts hyperfluorescent stromal vessels that indicate choroidal vasculopathy and hypofluorescent dark dots that correspond to granulomas and delayed patchy filling of choroidal vasculature . The late phase reveals fuzzy stromal vascular patterns and diffuse choroidal hyperfluorescence. Disc hyperfluorescence is suggestive of severe disease. ICGA can detect subclinical choroidal inflammation in very early stages or even after systemic therapy [1, 5-7]. Treatment goals in VKH include early diagnosis and suppression of active inflammation, along with prevention of recurrent inflammation and vision-threatening complications, such as glaucoma, bullous retinal detachment, and choroidal neovascularization. Systemic corticosteroid treatment is the preferred therapy for VKH disease, especially during the acute uveitic stage. It has been shown that the route of corticosteroid administration (oral versus intravenous) does not impact the visual acuity or occurrence of visually-significant complications in the treatment of acute VKH . For severe disease, the suggested protocol is intravenous methylprednisolone administration for three days followed by oral high-dose prednisone treatment. In mild-moderate disease, high-dose oral prednisone may be sufficient at 1-2mg/kg/day. The steroid dose should be slowly tapered over approximately six months to prevent recurrence . 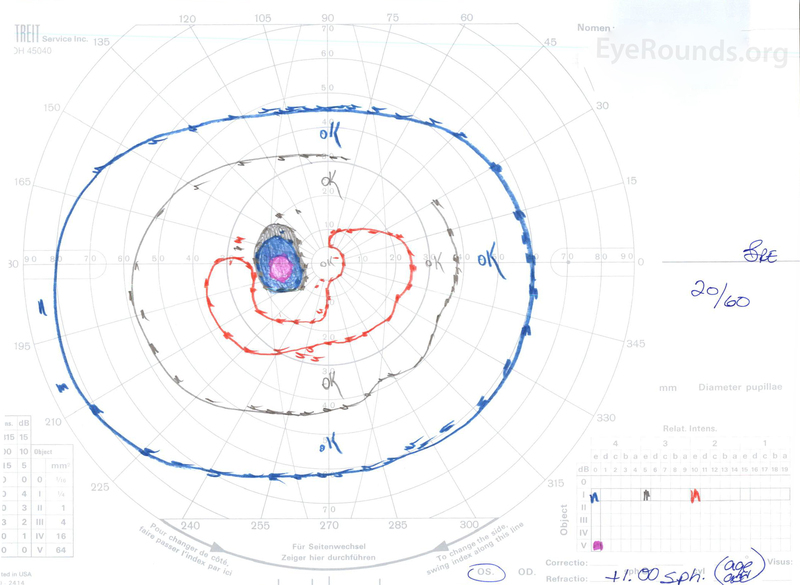 Aggressive early treatment, alongside serial FA testing showing disappearance of dye leakage through the RPE, may help to prevent further disease progression, recurrence, and extraocular manifestations . Topical steroids and cycloplegics can decrease cells in the anterior chamber and vitreous humor. Intravitreal and sub-Tenon injections of triamcinolone have been used for short-term control of intraocular inflammation during the acute or recurrent phases; these local therapies should be considered in the case of recalcitrant disease and in patients who poorly tolerate the unfavorable systemic side effects of steroids given the extended steroid taper. Intravitreal anti-VEGF injections are sometimes used for control of choroidal neovascularization and in cases of persistent foveal serous retinal detachments [1, 5, 7, 25]. Steroid-sparing agents including antimetabolites, calcineurin inhibitors, biologics, TNF-alpha inhibitors, or cytotoxic agents can be used to treat VKH and should be carefully monitored, often in coordination with a rheumatology service . There has been ongoing discussion regarding the use of non-steroidal immunosuppressive agents as first-line therapy for VKH disease. However, a recent study revealed no differences in outcomes between early first-line immunomodulatory treatment (IMT) and prednisone treatment alone . Further, immunosuppressive and biologic therapies are expensive and require careful pre-treatment evaluation as well as frequent follow-up with blood work to assess for serious side effects. In the chronic-recurrent stage, frequent recurrence may suggest resistance to corticosteroid therapy and suggests need for steroid-sparing immunomodulatory treatment [1, 6, 11]. The preferred agent for steroid-resistant recurrence or steroid-intolerance is cyclosporine . Infliximab, rituximab, adalimumab, and interferon alpha-2a are biologic agents that have also been used to treat refractory uveitis in VKH disease. To treat the anterior uveitis often associated with acute VKH, topical steroids (e.g., prednisolone acetate 1%) and topical cyloplegia (e.g., cyclopentolate 1% or atropine 1%) should be prescribed depending on the degree of anterior chamber inflammation. Ocular complications are commonly associated with VKH disease. Given the multiple stages and variety of presentations in which a patient can present with VKH, treatment may be delayed in many cases. In severe forms of VKH and in recurrences, intraocular inflammation may be difficult to control and may result in structural damage. Over 50% of patients develop related complications, including cataract, secondary glaucoma, choroidal neovascular membranes, subretinal fibrosis, or a combination of these (Figure 6) . Bowling B. Uveitis. Kanski's Clinical Ophthalmology New York, New York: Elsevier; 2016; chapter 11; p. 395-465. Yeh PT YC, Yang CH, Lin CP. Nonrhegmatogenous Retinal Detachment. In: Schachat AP SS, Hinton DR, Wilkinson CP, Wiedemann P,, editor. Ryan's Retina. New York: Elsevier; 2018; chapter 99; p. 1828-1849. Goto H RK, Rao N. Vogt–Koyanagi–Harada Disease. In: Schachat AP SS, Hinton DR, Wilkinson CP, Wiedemann P, editor. Ryan's Retina. New York, New York: Elsevier; 2018; chapter 78; p. 1505-1515. Freund BK SD, Mieler WF, Yannuzzi LA. Inflammation. The Retinal Atlas. New York, New York: Elsevier 2017; chapter 4; p. 279-398. Rao N. Vogt-Koyanagi-Harada Disease. In: J YMaD, editor. Ophthalmology. New York, New York: Elsevier; 2014; chapter 7.17; p. 761-763. Nussenblatt RB. Vogt-Koyanagi-Harada Syndrome. In: Whitcup RBNaSM, editor. Uveitis: Fundamentals and Clinical Practice. 4th Edition ed: Elsevier; 2010; chapter Chapter 24.